Yesterday, casting about for an unfamiliar road to ride, I fell upon Black Road. Actually I was looking for an unfamiliar and easy to ride road, but Black Road was only the former. 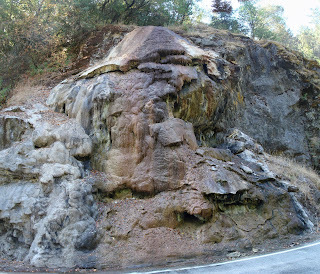 It's a little tricky to get to Black Road from my house in the Almaden area. First, I took the familiar route to downtown Los Gatos, over Blossom Hill road. 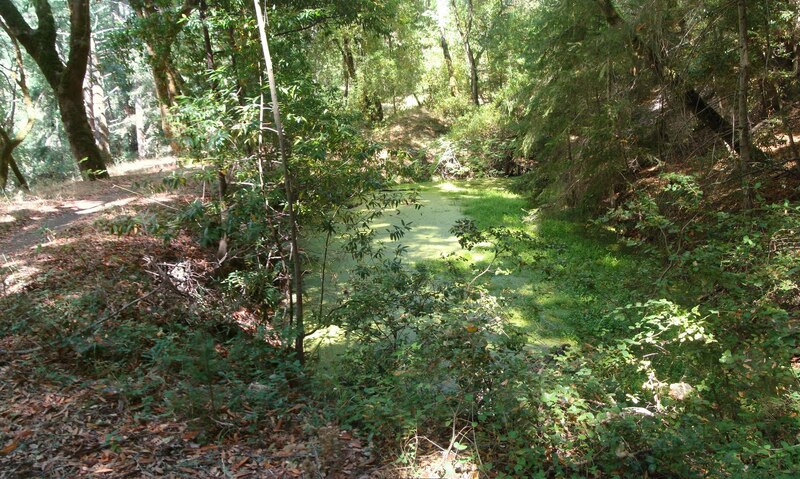 Then I rode down the Los Gatos creek trail, which was uneventful except that, for the first time I can remember, my road bike's wheels spun out on the steep little ramp near the dam, and I had to walk the bike up. I guess the path is getting a little dusty this late in the dry season. 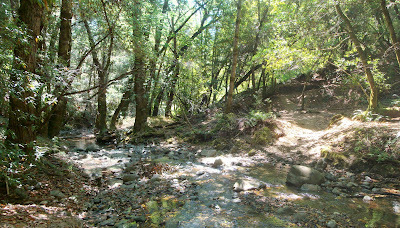 The tricky part comes after the climb up the dam to Alma Bridge Road, next to the Lexington Reservoir. Basically I want to get to the Bear Creek overpass over I-17, but Alma Bridge Road ends a few hundred yards north of the overpass. So I can either ride the wrong way on I-17 (doesn't seem wise), go the long way around the reservoir (too lazy for that), or (and here's the tricky part) ride up the dirt path between I-17 and the reservoir. I've been on that path before, coming the other way, but at that point it was muddy and I was on my mountain bike. I knew that the path would be dry after months of no rain, but I was pleased to find that it was in fine shape, even for my road bike. Once across I-17, you take a right and soon find yourself on Black Road. I had read that Black Road averaged about 6.3%, which sounded reasonable to me. I should have read more carefully: that average includes a substantial flat portion in the middle, and the beginning and end are much more steep. Along the way you get several great views toward the north, including the view above. That view may not seem like much, but from this vantage point you can see lots of the other rides around the Lexington Reservoir area. On the far left you can see the top of Bohlman, which I have yet to climb. Toward the middle, on the same hill, is El Sereno. Further to the right is St. Joseph's Hill, with Mount Hamilton directly behind it. On the far right you can just make out the top of the Priest Rock Trail, where it meets up with the Kennedy Trail. Amazing view of an amazing area. Black Road climbs up to about 1600 feet, then levels out for a mile or so. In this section there's a school where, rumor has it, you can refill your water bottles. After the road heads up again, it enters a lovely redwood forest and shrinks to a single-lane road. In this section the road bends around quite a bit and, on this Sunday at least, it had much less traffic. The woods are dense and the road is largely shaded, making for a pleasantly cool ride on this nice warm day. This all made for glorious seclusion, the quiet spoiled only by the wheezing and panting of a lone cyclist (specifically: me). 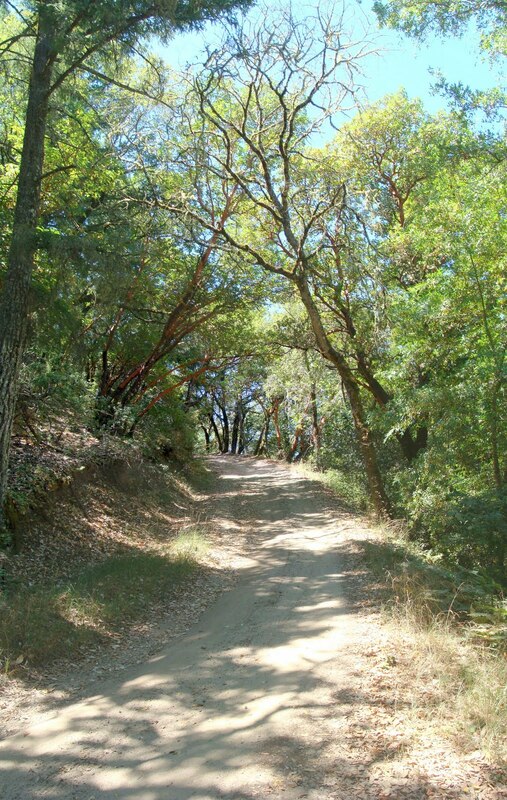 At about 1900 feet is an entrance to Sanborn County Park. The trail here is labeled the John Nicholas Trail, but on maps it's called Sanborn Road, and apparently links up with Congress Springs, aka Route 9. Unfortunately bicycles aren't allowed. At just over 2400 feet Black Road finally meets up with Skyline. I took a left, riding south toward Bear Creek Road. North of this point Skyline is a two-lane road, but here it too becomes a lonely single lane road as it winds, mostly level, among the trees. At Bear Creek Road I had to decide whether to ride down Bear Creek Road, or continue on the very charming Summit Road across I-17. I've never been on Bear Creek, and I decided to save that experience for later. I enjoyed Summit, including the little interstitial climbs, then dropped down Old Santa Cruz Highway and basically reversed my route. The Garmin gave me 36 miles and 3270 feet of climbing, which I think should have been closer to 2600. Practice makes perfect. Yesterday I had the ride I was aiming for two weeks ago, before taking a wrong turn. The plan was the same: ride up Stevens Canyon Road to the Canyon Trail, all the way through to Page Mill Road. Last time I took a wrong turn and ended up grinding up the Table Mountain and Charcoal Road trails. This time I'd be more observant. The kids head back to school tomorrow and football is starting to show up on TV, so it must be the end of summer. Appropriately, yesterday was cool, and when I rolled off at about 8:30 the hills were still thick with fog. Another difference from last time was that I started from home, rather than driving to Saratoga. That adds about 10 miles to both the start and end of the ride, but last time the mileage was minimal, and besides I was feeling good. I rode Blossom Hill to Los Gatos, then the Los Gatos/Saratoga road from... well, from Los Gatos to Saratoga. From there, Route 9 took me to Pierce, where once again I climbed the little hill that peaks at the entrance to the Mountain Winery. Pierce then descends to Mt. 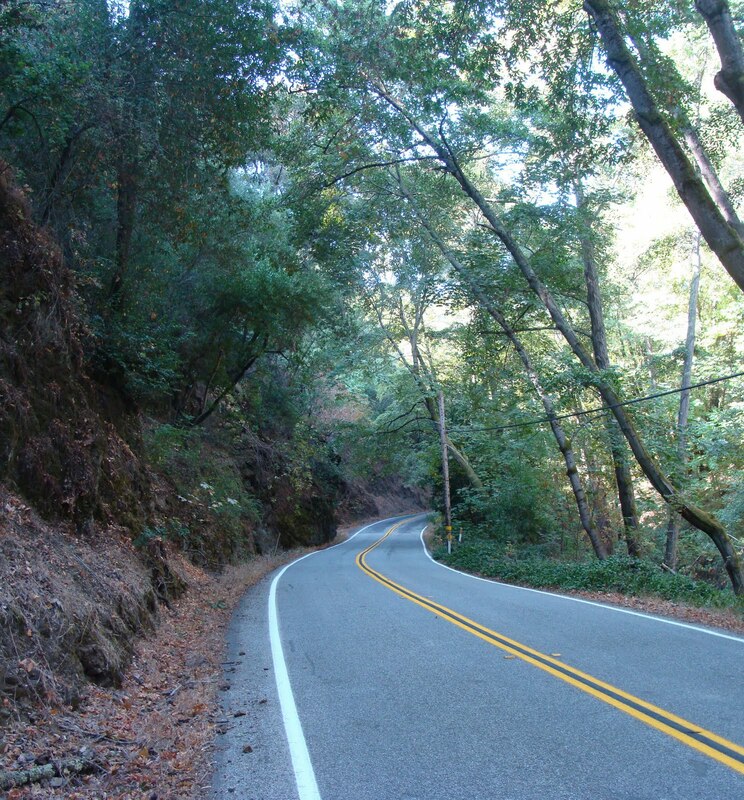 Eden Road, which climbs back up to about 800 feet as it crosses a saddle heading toward the Stevens Creek Reservoir. Mt. Eden winds its way down to about 550 feet by the time it meets up with Stevens Canyon Road. Yesterday morning was perfect for a bike ride, and I wasn't the only person to notice it. All through this section I was seeing plenty of riders, including several large groups. 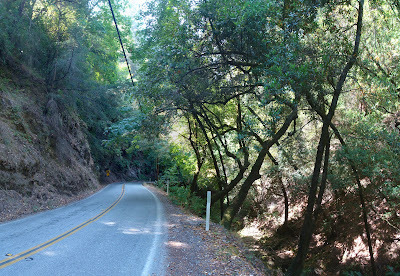 This part of Stevens Canyon Road climbs very gradually from about 550 feet at the intersection to about 1200 feet at the gate about 4 miles away. It runs along Stevens Creek, crosses many bridges, and shrinks to a one lane road as you approach the gate. 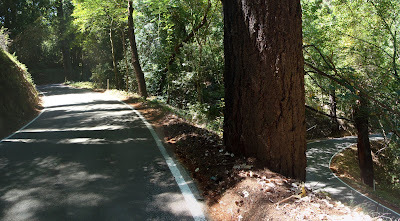 The road is largely shaded with no shoulder, but very little traffic apart from bikes. The path beyond the gate is really a continuation of the single-lane road until just before it enters the Monte Bello Open Space Preserve, when it runs across a comparatively rough section. One reads occasionally about a section of this trail re-routed around a landslide, and I suspect that must be what this is. In this section the trail becomes single track, and will remain mostly single track until you're pretty close to Page Mill Road. On the 15 miles leading up to this point, listening to my fat wheels waste energy against the pavement, I was reminded of a piece of advice I picked up on Usenet a while back. The idea is that, unless you're on a very technical trail, the vast majority of most rides will be better suited to a road bike than a mountain bike, and even on the dirt sections the road bike will mostly be equal. The mountain bike will have an advantage only on very short sections. With that thought in mind, I started at this point to try to judge whether I could have taken my road bike instead. I couldn't be sure where I had taken the wrong turn two weeks ago, but I had a good idea. On this trail there are lots of little forks in the road that come together a few meters later, routing around difficult or damaged sections of trail. But one of them is a real fork, and once I again I saw no trail sign. Nonetheless, I managed to take the correct, right fork. A while later I saw the Palo Alto City Limits sign, and since I hadn't seen that last time I knew I was on the right track. Somewhere along here the trail crosses the creek and then climbs up a very short but steep hump. I lost my traction and ended up having to walk my bike. And what did I find at the top of the climb (or maybe top of the "push")? A whole gang of riders re-grouping at the intersection with the Grizzly Flats trail. Sigh. Pride goeth before the climb. All through this section the trail has continued its gradual rise, and by this point it's probably up to 1400 feet. But here the character of trail changes, and you start seeing steeper, longer, leg-burning ramps. In between two of these painful ramps I decided it was an appropriate time for lunch. On the map, you can see that the section after the Table Mountain fork runs along a ridge. I was expecting to see a drop-off to the left and cliffs to the right, but it doesn't really give that impression. The trail runs through a thick wood, still damp this late in the season. Even when you can notice the ridge line, the trees still surround and enclose the trail, giving a sense of splendid isolation. 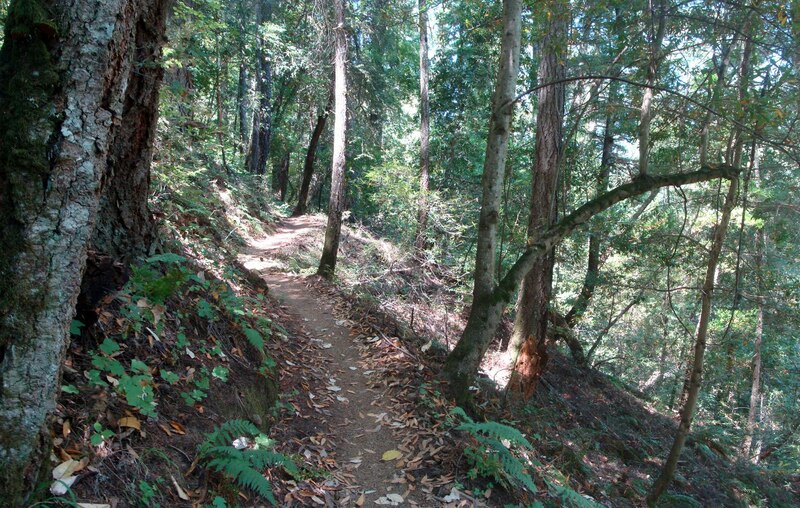 The Canyon Trail intersects with the Indian Creek Trail, which snakes up to Black Mountain. It's easy to take the wrong turn there, too, but at least there's a sign. After that there's just one more steep section until the trail levels out to meet Page Mill Road. Thus endeth the Canyon Trail. At one point I was toying with the idea of taking a right on Page Mill to where it meets the Montebello Trail, and reversing my ride from last month. But I stuck to the original plan, turning left toward Skyline, and then left again on Skyline toward Saratoga Gap. Since I had ridden from home, I had lots of options at this point. I could head down Route 9 again, or continue on Skyline to Summit, then down through Los Gatos. I figured I would think about it at the Saratoga Gap parking lot while enjoying a soda or two. Except that wasn't going to happen, because I didn't have my wallet, or any other money. I can't say I forgot it, because I deliberately decided not to bring it. That was a lousy decision on several grounds. In the end I retraced the steps of the ride two weeks ago, heading down Route 9 to Saratoga, and then home. The Garmin shows 49 miles, and I'd guess I did about 3000 feet of climbing (the device showed 4200). So now, having ridden the whole ride, what bike should I have taken? For me, it's clearly the mountain bike. I was wishing for my road bike for 45 of the 49 miles, but those other four miles were quite loose and dusty. I probably would have made better total time on the road bike, but I wouldn't have enjoyed the Canyon Trail as much. And for me, the enjoyment is what it's all about.